Joe McFerrin II, president and chief executive officer of the Portland Opportunities Industrialization Center and Rosemary Anderson High School, celebrates 50 years of leadership in workforce training. Community advocates, including Mayor Ted Wheeler and Andrew Colas of Colas Construction, joined Joe McFerrin II, president and chief executive officer of Portland Opportunities Industrialization Center (POIC) and Rosemary Anderson High School (RAHS) to celebrate POIC’s 50 years as a leader in workforce training for communities of color. 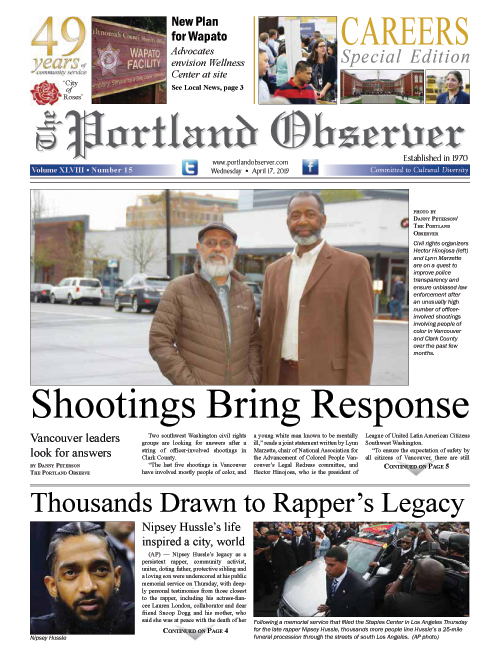 POIC was established in Portland in 1968 to provide employment training and industrial development programs for people of color, demonstrating the strength of African Americans resisting persistent racism and discrimination through their own community-based programs and organizations. "Our doors are open to everyone. We work with high-risk youth and their families to provide education, job training, and job placement for low-income citizens in our community," said McFerrin. Colas, the keynote speaker, recently helped POIC launch a new pre-apprenticeship program for trainees to develop construction skills and prepare for a career in the trades.